Beautifully upgraded second floor condo with elevated views minutes to Cardiff-by-the-Sea is sure to please the first time homeowner, investor, downsizer or anyone looking to live the coastal lifestyle near beaches, restaurants and shopping. 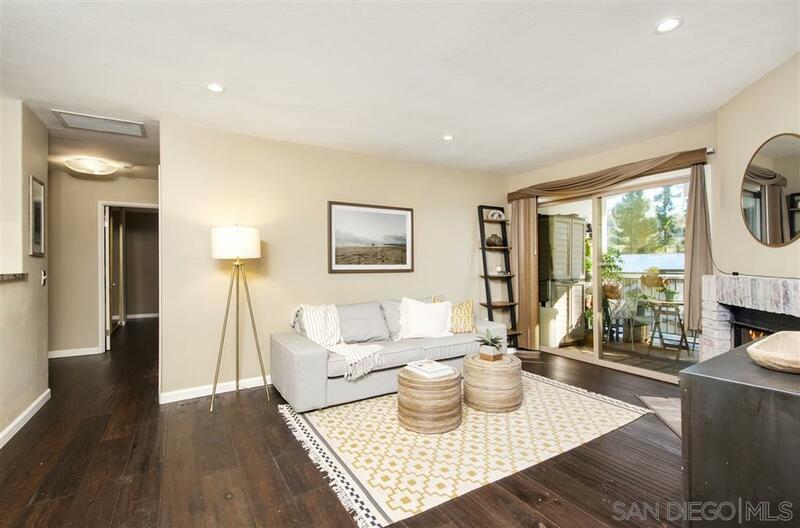 As you ascend up into the light-filled open concept family room and fully remodeled kitchen with stainless steel appliances your day is greeted with peace. Wonderfully appointed with insulated hardwood flooring throughout, see supplement..., tile in the chef's kitchen with an oversized sink, custom tile backsplash, water filtration system and self closing cabinets, this is your chance to enjoy entertaining or the simplicity of cooking in the comfort of your new home. The private master retreat calls you to relax in comfort. The bright second bedroom can be a guest bedroom or office. Just beyond the cozy fireplace is the enclosed patio with sunrise and park-like views of the "Pacific Pines." There is no need to go far with the in-unit stackable washer/dryer, pool, spa, gym, clubhouse, tennis court and BBQ area. Make easy coastal living yours at an affordable price!